The IC-7000 has a built-in Digital Voice Recorder (DVR). 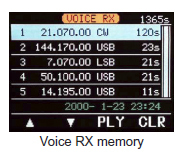 You can record your callsign, CQ, or other information in four transmit playback memories with alphanumeric labels. A total of 90 seconds is available for the four memories. A front panel REC control allows you to record incoming signals for up to 25 minutes (99 channels at 120 seconds per channel). The DVR makes portable contesting or mini-expeditions a breeze!